How to Generate your 16 digit Virtual ID ? 2) Enter your Aadhar number . 3) Enter the OTP that you got on your registered mobile number. 5) Then Submit the form . After successful verification of OTP your VID ( that is Virtual ID ) will be provided on your registered mobile number as SMS. In case user forget this VID that is Virtual ID then they can follow same steps mention above but only in 4th step you need to select option for Retrieve VID . By this method now you need not to share Aadhar number .All you need to share your Virtual ID . The Virtual ID is a random 16-digit number. *The ID can be generated as many time as possible. *The older ID gets automatically cancelled once a fresh one is generated. 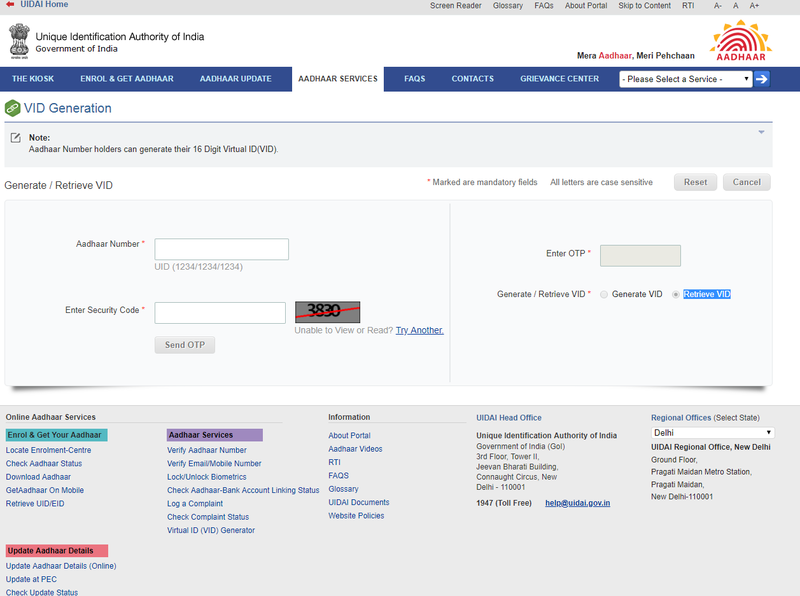 *Users can go to the UIDAI website to generate their virtual ID which will be valid for a defined period of time, or till the user decides to change it. *The ID, along with the biometrics of the user, would give any authorised agency, like a mobile company, limited details like name, address and photograph, which are enough for any verification. *Agencies that undertake authentication would not be allowed to generate the Virtual ID on behalf of the user.